Make your holiday shopping easy this year: everyone gets a book! Join authors Peg Alford Pursell, Joan Frank, and Janine Kovac for a night of readings at Napa Bookmine. Stay and get something for everyone on your list! Peg Alford Pursell (www.pegalfordpursell.com) is the author of SHOW HER A FLOWER, A BIRD, A SHADOW, a collection of flash fiction, micro-fictions, and hybrid prose. She is the founder and director of the national reading series Why There Are Words and of WTAW Press. Joan Frank (www.joanfrank.org) is the author of six books of literary fiction and an essay collection about the writing life. Her latest novel, ALL THE NEWS I NEED, won the Juniper Prize for Fiction. Janine Kovac (www.janinekovac.com) is a recipient of the Elizabeth George Foundation Fellowship. 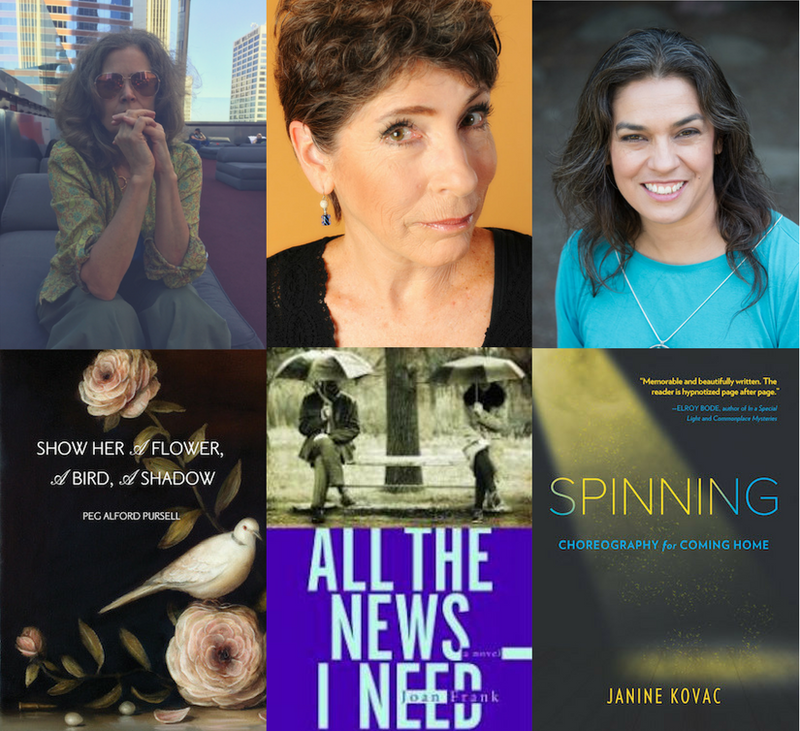 Her debut memoir is SPINNING: CHOREOGRAPHY FOR COMING HOME was a semifinalist for Publishers Weekly's 2017 Booklife Prize. "Reading [Show Her a Flower, A Bird, A Shadow] is like walking through a snowfall of petals—and thorns. There is a light airy feeling to Peg Alford Pursell's delicately worded fragments that is seductive, at first, until you realize that each swirl contains small stabs of loss and pain and violence. A really beautiful, unique collection. "Joan Frank is a human insight machine. In All The News I Need, two old friends, bound together by economy, loneliness and desire, travel through France. What ensues is life itself, rendered with subtle ferocity on every page. Joan Frank writes prose like no one else’s – so psychically vivid it’s like walking around wearing other people’s minds." "A deft and moving exploration of fear, strength, and the ways in which our past lives are always catching up with our present. Janine Kovac weaves her terrifying introduction to motherhood and her career as a professional ballerina as naturally and masterfully as if she's choreographed a new dance. And she has."